The Naini Lake in Nainital has fallen victim to careless human behavior. The lake’s water, which has spiritual importance, is being polluted by garbage and sewerage water. A local says that the lake water has spiritual importance and locals use it to drink. “This sewage water is polluting the holy water of this lake. The authorities should clean it so that the purity of the lake will be maintained,” a local resident said. The authorities have initiated a National Lake Conservation Project (NLCP) with an amount of 110 million rupees, but no improvement is visible as yet. 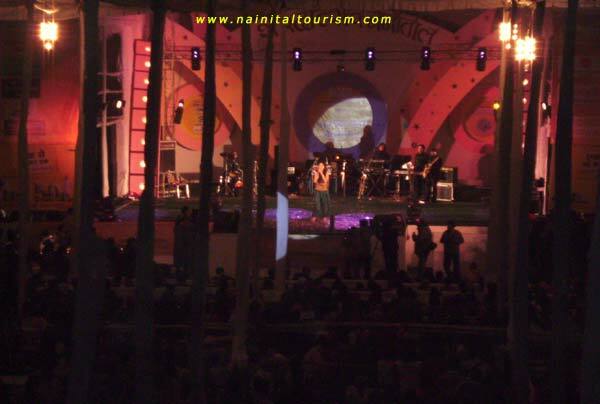 Nainital in Uttarakhand has always been a major attraction for tourists around the year. But the early Monsoon showers this time of the year has added to their joy as everyone is enjoying a cold weather in summer following showers. The tourist season has already hit its peak this time of the year here due to a large presence of visitors. Most of the tourists here are pleasantly surprised to have such a nice weather conditions saving them from the scorching heat back in the plains. “I am feeling very good here. I enjoy boating a lot and I’ve come here many a times earlier also. I am feeling very good as it’s raining here,” said Manjulika, a Delhi tourist. “We are enjoying a lot and feeling very good here. The clouds were with us down here, it seems beautiful” said Ashva, another tourist. Meanwhile, the hospitality industry is delighted to have such a good number of tourists arrival in Nainital. The parking bays and the hotels are packed to capacity. Nainital, Feb 19 (ANI): A lepidopterologist, Peter Smetshek, claims to have discovered seven new species of butterflies in the lush green jungle of Uttrakhand’s Nainital district. Researching on the butterflies in the Himalayan region, Smetshek said that these insects can be used as a bio-indicator to ascertain the health of the jungle. He attributes his liking for insects to his upbringing. “My father started research on butterflies in the year 1949, many years before my birth. I am brought up in this environment of collecting and identifying the various species of butterfly. I was always keenly interested in this field,” said Smetshek. In his fifteen years of research, published in many journals, Smetshek has discovered various new species. His collection comprises twelve sub-species of sloth and two sub-species of butterfly. He also believes that the Himalayan region is facing number of problems such as flood due to senseless deforestation. Smetshek says that this bio-indicator can also be used in counting the number of plants in the region. Through his research he has found seven new families of sloth. Smetshek has discovered and given name to new families like Dysaethria, Reticulata, Himalayca, Multi Strigarta, Ruptaria, Bicauilata and Restricta. February 19, 2010 (Sampurn Wire): Actor Nirmal Pandey passed away on 18 February 2010 following a cardiac arrest. According to family sources Nirmal was not keeping well for some time, still this has come as a shock to them. A graduate from the prestigious National School of Drama, the actor did his schooling in Almora and Nainital, Uttarakhand. 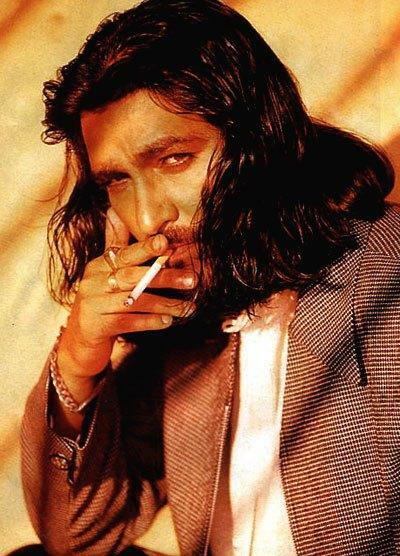 He first shot to fame as Vikram Mallah in Shekhar Kapur’s much acclaimed Bandit Queen (1996). Nirmal was much appreciated in Amol Palekar’s Daayara where he played the role of a transvestite and Sudhir Mishra’s Is Raat Ki Subah Nahin, Pyaar Kiya Toh Darna Kya, One 2 ka 4 and Shikari, where he established himself as an actor par excellence. Apart from films Nirmal has also acted in several television serials, including Hatim, Raajkumar Aaryyan, Shhh… Phir Koi Hai and Princess Dollie Aur Uska Magic Bag. In addition to being a good actor, Nirmal was also a versatile singer and had released an album called “Jazba’. Nirmal’s last release was the Telugu film Kedi. Shekhar Kapur remembers Nirmal as “A terrific actor and human being who had yet to achieve his full potential’. Nainital, Jan 27 (ANI): Uttarakhand women have formed a self-help group where they make and sell herbal medicine from the plants found in the forests around there. Most of these women do not have any formal education or training but this group allows them to make an income. It is a long process, which begins with collecting nirgundi (chaste tree) leaves, which is crushed into a paste.The paste is then mixed with water and cooked to make a herbal oil. “First we take the juice out from the leaves, then we mix it with five glasses of oil and put one glass of oil in the water to cook it. We then put carom seeds in the mixture and after it settles in the pan, we put camphor in,” said Basvi Devi, a worker. “Nirgundi (chaste tree) oil is good for aches and sprains. It’s also good for back pain. It also promotes natural sleep. This is what people use it for,” said Shipavali Devi, a woman worker. They sell large bottles of Nirgundi (chaste tree) oil for 100 rupees while the smaller bottles go for 50 rupees. However, with local investment, the industry has potential for growth. Along with these women, projects like this can also benefit the economies of rural India, which accounts for around 70 percent of country’s a billion populations. (ANI). Nainital, Dec. 11 (ANI): Concerned with polluting water streams in Uttarakhand, schoolchildren in Nainital have pledged to clean the Bhimtal lake during their holidays. 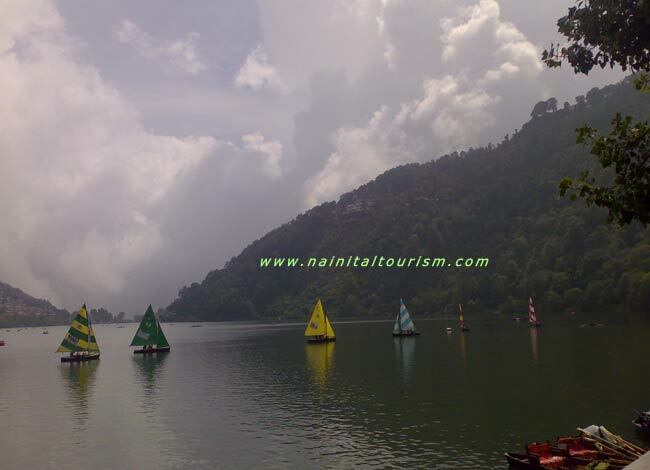 Nainital’s renowned lakes attract thousands of tourists from all over the country every year. But increasing pollution, usually caused by tourists, has become the main cause of lower levels and filth-ridden waters. Concerns over the state of these lakes, which are also sources of fresh water for the surrounding towns, brought together school children to take up the challenge to clean the Bhimtal Lake during their holidays. “People are involved in cleaning the environment, and the rivers, and the lakes. So we thought that Bhimtal is known for its lake and in the summer time, natural resources get choked because of pollution, which has been created by man. Therefore, we thought of creating awareness, starting with our children and engaging them in the cleanliness of the lake, and we approached the lake development authority,” said S.S. Negi, Principal, Lake International School, Nainital. The students were also involved in other social activities as a part of their curriculum, but they have vowed to clean the Bhimtal Lake. “We do social activities also but when we saw that our lake, which is the main (water) source of Bhimtal is getting deteriorated, we thought of cleaning it first and then (doing) the other social activities,” said Meenasha Kadpal, a school student from Nainital. Students went into the water and cleaned the lake by removing algae and plastic bags, which blocked the mountain stream feeding the lake. “In summer time, the lake water dries up and tourists return disheartened. We thought of cleaning the lake to maintain the water level, as the stream from the mountains gets choked. That is why we decided to clean the lake during our holidays,” said Akashdeep Singh, a student of Lake International School, Nainital. Nainital, Nov. 25 (ANI): As part of the Uttarakhand Government’s newly constructed adventure sports wing, a batch of school children are being trained in parasailing in Nainital. This camp has a batch of 30 school children, including five girls from various local schools. It will be in action until November 26 in Nainital. The school children are very excited with the prospect of trying out parasailing. “There are many career options in this field now a days. This training will also help in case in future we join army or naval forces,” said Mukesh Joshi, a trainee. However, this camp is not a one-off case. The State Government has launched a new adventure sports wing under the aegis of its tourism department to develop and train the youth of the state in a variety of adventure sports. “Uttarakhand’s infrastructure allows for better training of the youngsters in adventure sports. We have developed a special wing to provide training in adventure sports and encourage youth to take up these sports as a means of livelihood in their future,” said Lata Bisht, Adventure Sports Officer, Kumaon region, Uttarakhand. The new wing will soon be holding many more such camps to provide training to the youth of the state in other adventure sports as well. (ANI). Nainital, Nov.21 (ANI): Following various incidents of mishaps due to accidents or vehicles falling off the high cliff into the deep gorges, accident-prone hillside roads are being fenced with bamboo along Kathgodam-Nainital National Highway in Nainital. The initiative Bamboo bio-fencing has come up as a pilot project of the Forest Department of Nainital. Under the project, the Forest department and the Department of Transportation will plant bamboo along the roads of Kathgodam Nainital National Highway to prevent road mishaps. “On this road to Kathgodam hillside roads vehicles fall into gorges frequently, keeping this in mind we aim to minimize vehicular accidents and the loss of life and property, which results from such mishaps. Bamboo bio fencing is being done on the slope-side of the roads. Plantation will be done in three columns; one above the other, to avoid loss of life and property.” said Parag Madhurkar Divisional forest officer (DFO), Terai Central Forest Division. According to the authorities, frequency of mishaps is very high on 250 identified risk zones on the spiral hill roads. Forest authorities are giving priority to Government figures that show 500 fatalities and above 1000 injuries resulting from the road mishaps on spiral roads every year. Bamboo is chosen for the bio fencing as it can create impenetrable mesh to keep vehicles from falling into the deep gorges. Forest department authorities hope the bio fence will develop enough strength to offer resistance to crashing vehicles, once it gets developed enough in about two years. As the barren hill roads sides will be covered by green bio fence, authorities believe that bio fencing will prove to be eco-friendly. Nainital will be the first to present the model of bio fencing in the Uttarakhand State. Authorities believe that if this experiment proves successful succeeds, it will provide a breakthrough in high altitude area. (ANI). NNainital (Uttarakhand), Nov 17(ANI): Women belonging to a self-help group in Nainital are learning the craft of making toys out of unpolished stones and in the process making a decent livelihood. ‘Pehal’, a voluntary organization working in Nainital, has taken several women of the self-help group under its wings and is training them in modern stone craft. The women collect stones from the riverbanks and give them a variety of shapes like animals, bird and miniature deities. The organization buys the toys and after giving them finishing touches puts them on sale. The stone toys sell like hot cakes in various fairs organized at various places, including New Delhi and Chandigarh. “We take these toys to several state fairs to sell. Also, these women get a share in the profit earned by the organization,” said Farooq Hussain, secretary of ‘Pehal’. The price of these toys ranges from Rs 20 to100, while the women receive a daily wage of Rs. 100. Apart from that, ‘Pehal’ also gives them a share in the profit earned. “I got to know about this opportunity through ‘Pehal’ and has been a part of the project ever since. It has come out to be a good source of livelihood for us,” said Manju Devi, a beneficiary of the project. Considering that there is almost no investment required in this project, the women are quite content with their mode of livelihood. (ANI). Nainital (Uttarakhand) Nov 6th, 2009 (ANI): To give the tourism sector a boost in the Uttarakhand’s Kumaon region, the scenic Nainital city is hosting this year’s edition of the annual autumn festival named ‘Sharadutsav’. At a colourful event, the ‘curtains-up’ for ‘Sharadutsav-2009' was witnessed to an overwhelming response of locals and tourists on Thursday. The five-day festival promises to showcase a lot of programmes to entertain the audience and tourists visiting the hill station. Apart from presenting the local cultural dance to the audience the programme included a mimicry show by stand up comedian Sudha Mishra. Renowned Sufi singer Kailash Kher enthralled the audience in his melodious voice with a blend of Bollywood songs and Sufi music. According to the officials of the Tourism Department, the inflow of tourists this year has increased by 15 percent and no wonder, they expressed happiness at these trends. 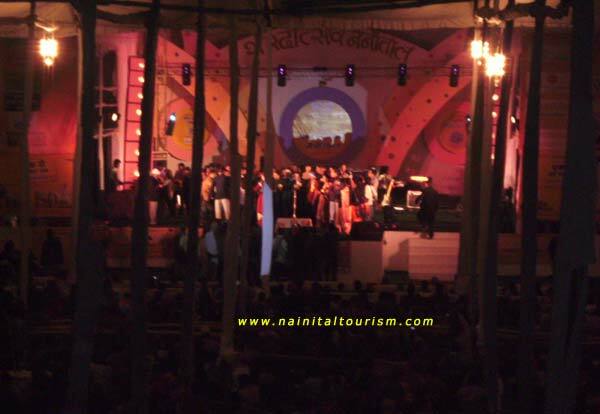 “If we look from a broader perspective, last year around 6,39,000 tourists visited Nainital. This year till October around 6,50,000 people visited Nainital and by the end of this year we expect the number to reach the range of 7 to 7.45 lakhs, an increase of 15 percent,” said J C Beri, Regional Tourist Officer of Kumaon. On their part, the audience at the festival was thrilled to see popular as well as talented singers and artists performing in the town, famous for its lake. “Till now we had only seen Kailash Kher on television. 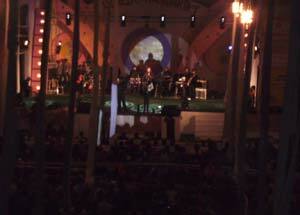 It was for the first time that we saw him performing live. We really enjoyed his performance and wish that he performs next year also,” said Kanika, a local. Braving the drop in the mercury, the visitors with utmost enthusiasm have been enduring the chill and enjoy the warmth of the festival to the fullest. Nainital, Sep 21 2009 (ANI): Women in the hill station of Nainital have launched a cleanliness drive. Situated at an altitude of 2000 feet above sea level and surrounded by green hilltops, Naini Lake is a gift of Mother Nature. It is a major tourist spot and a source of water supply to the city. Over the years, pollution levels in the Naini Lake have increased due to the influx of tourists, unplanned development drives by the administration other human activities. Adding to these factors is the waste released from hotels and lodges. Women have come under the banner of the Maitri Women Organisation to initiate the clean up drive. Cleanliness activities are undertaken once in every month. “We want to spread the message of keeping Nainital clean. The lake is our soul. If it will not be there, then what will happen to the city, as water supply comes from the lake?” asked Vimal Aswal of the Maitri Women Organisation. “Therefore we are trying to keep the lake clean and so we are cleaning the streets and the waste materials lying nearby the drains from where unclean water enters the lakes. Thus, we always concentrate more on cleanliness of the area around the drains,” she added. The organisation is also performing street plays to raise the level of public awareness about the virtues of cleanliness. The Naini Lake is one of 64 ‘Shakti Peeths’ where parts of the charred body of the Goddess ‘Sati’, wife of Lord Shiva, fell. Sati’s eyes or ‘nain’ are said to have fallen here, giving the lake name, ‘Naini’, and the name of the town Nainital, ‘lake of the eye’. Nainital, Sep 18 2009 (ANI): With an aim to revive yacht sailing in the country, a 15-day camp is being organised in Nainital district of Uttarakhand where in school children are being trained in yacht sailing. Over 40 school students from the various parts of Uttarakhand and Uttar Pradesh are taking part in the camp, which is being conducted under the aegis of Indian Army’s Central Command. The Lucknow based Central Command is conducting such adventure camps for school children from over a decade. The participants are receiving guidance in the yacht sailing by a team of 11 Army instructors. “This yacht sailing is a great sport because these days it’s becoming extinct. Most of the people do not want to take part and people of Nainital are also not taking so much interest in yacht sailing. But I feel it’s a very adventurous sport and a great sport,” said Karel Caprini, a participant. Many of the participants also feel that the training would open up new job opportunities for them. “We have come here to revive this sport and as far as I can say it’s a very good sport and there is a lot of job opportunity in it. If we do well and learn the technique, we can make our career in the sports,” said Deep, another participant. According to the Chief instructor of the camp, Mahip Singh the main motive behind the camp is to popularise the dying sport among youth. “Basic purpose is that sailing is an international sport and the facilities available in Uttaranchal especially, which comes under the central command. We have got our sailors, who have participated in international levels and we got the expertise. So to give the young building up generation a chance to gain knowledge and finally if they have the interest, so excel in the sport. That’s why we have organised the camp,” said Singh. Nainital (Uttarakhand), Aug. 9 (ANI): Civic authorities in Naintal launched a fresh demolition drive of illegal buildings and structures, which were posing a threat to the fragile landscape and environment of the region, on Sunday. The natural beauty of Nainital that attracts hordes of tourists every year is gradually fading away with the coming up of several concrete structures, both legal and illegal. The Supreme Court also had taken a serious view of such developments, forcing the Nainital Development Authority to knock down all these illegal structures. “We had sealed this building in January. But, despite that, they carried on construction activities. An FIR (First Information Report) has also been lodged against this person. But, still he continued constructing. So, in the end, we had to demolish the building,” said Dheeraj Gabryal, Secretary of Nainital Development Authority. However, one of the building owners complained that he was not given any prior notice. “They did not give us notice. If they had given us a notice, we would not have built this,” said Ajiz Ahmed, owner of an unauthorised building. Environmentalists have maintained that the rapid illegal construction were responsible for the decline of greenery in the city. 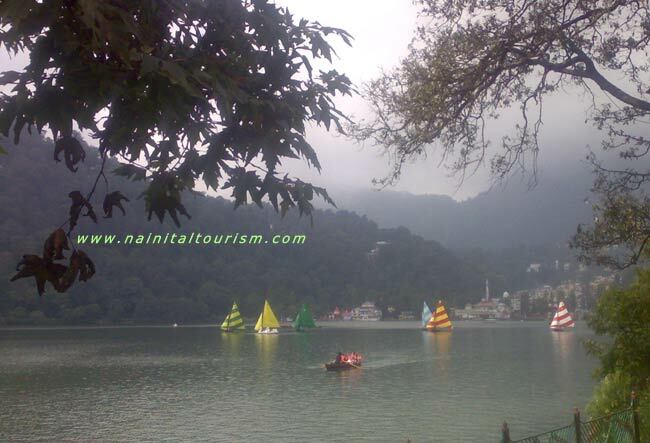 “The natural beauty of Nainital is extraordinary. In order to protect its beauty, we should have put a check on construction of several buildings. But, unfortunately, building after building was constructed, both legal and illegal. You can see many unauthorised buildings being demolished,” said Navin Verma, an environmentalist. Nainital, June 13 (ANI): Nainital’s Bhimtal Lake is home to a large variety of aquatic species. There is an island in the centre of the lake that used to have a restaurant, which fascinated a lot of tourists until its beauty was ruined due to public’s leftovers. 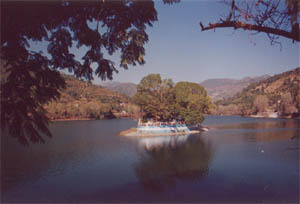 The Nainital Lake Development Authority hence decided to develop an aquarium on the island. They have converted the restaurant into an aquarium to prevent pollution and clean the lake. “Earlier, there used to be a restaurant on this island and a lot of tourists used to visit the restaurant. However, tourists used to leave behind waste that used to pollute the lake. The Nainital Lake Development Authority came up with the idea of converting the restaurant into an aquarium to stop the lake from being polluted,” said Dhiraj Gartayal, Secretary of the Nainital Lake Development Authority in Uttarakhand. A variety of fishes from countries like South Africa, Mexico and China have been kept in the aquarium that are captivating tourists’ attention. They are excited to watch different species of fishes in it. “I am having fun here. 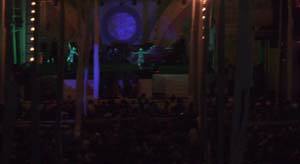 Seriously, it’s really nice to be here and watch different species of fishes. I am watching such species of fishes that I found only in books,” said Sakshi Goel, a tourist. Developing the aquarium took a year for lake authorities here. The aquarium consists of around 12 ‘aquaboxes’ that contain fishes. Nainital, Apr 20 (ANI): Authorities in Nainital have decided to install Closed-Circuit Television (CCTV) cameras at several crowded places as precautionary measure and to prevent untoward incidents.About five CCTV cameras have been installed across the hill resort for keeping a watch on the everyday incidents and also to solve problems like traffic jams and pick-pocketing.”These cameras have been really beneficial for us. We have placed the cameras in the crowded place to avoid any incident like pick pocketing or scuffle. These cameras have been very beneficial in finding out if people are facing any problem especially in crowded places,” said K S Hayanki, inspector in charge, Nainital. Residents are also happy with the security measure taken as they believe any incident can happen anytime.”Nainital, is a tourist town and lakhs of tourist come here, so there was requirement of such cameras. With the help of these cameras, police can keep a watch on the movement happening. We have to be vigilant always because any untoward incident can take place anytime,” said Rajesh Shah, a resident. Nainital, Apr 18 (ANI): Nainital-based Regional Oak Tasar Research Centre has created a world record in the field of silkworm egg laying. The scientists and other staff members of the research centre are very pleased by the way the project has shaped up. The average eggs per moth at the research centre are in the range of 240 to 260 as compared to China’s 160 to 200 eggs. The number of eggs per gram in the research centre is 108-110 in comparison with China’s 120 eggs per gram. These yardsticks signify that the eggs of Oak Tasar Research Centre are healthy. The main reason for the success can be attributed to the innovative measures taken by the scientists at the centre. “We provide good feed to the silk worms due to which the silk worm gains more weight. When it converts into pupa, it becomes big in size because of which the moth is also big in size and when the moth is big, it will certainly give more number of eggs,” said Dr. R. S. Yadav, a scientist of Regional Oak Tasar Reserch Center. The institute has also been taking special care to minimise the egg losses. “Earlier the eggs were kept in wooden baskets, now they are kept in plastic baskets. They have been kept in an aerated environment because of which the scrapping is also good and the recovery of eggs is more,” said Dr. Somesh Paliwal, In-charge of Regional Oak Tasar Research Centre. The Appropriate Technology India (ATI), the biggest silk research organisation in the country, has given an award to the Regional Oak Tasar Research Centre in recognition of its immense contribution in the field of Oak Tasar development. © 1999 - 2013 OnLine Technologies. All rights reserved.